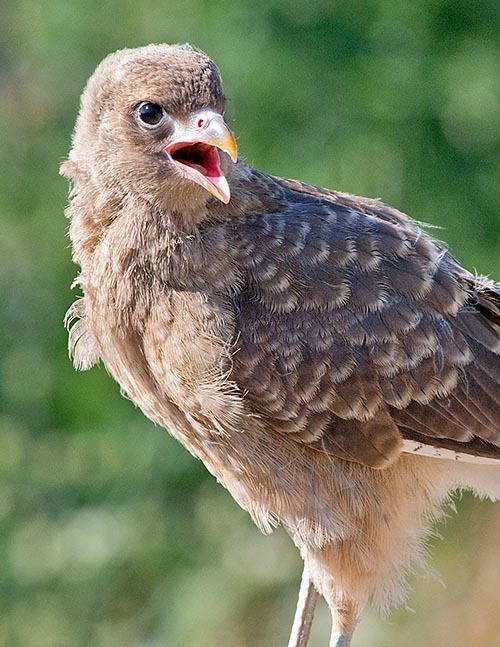 The Chimango caracara (Milvago chimango Vieillot 1816) is a diurnal raptor belonging to the order of Falconiformes, to the family of Falconidae, to the genus Milvago and to the species Milvago chimango. The systematic ornithologists con- sider two subspecies: the nominal Milvago chimango chimango (Vieillot 1816) and the Milvago chimango temucoensis (W. L. Sclater 1918). The name of the genus “milvago” comes from the Latin term “milvus” and means kite, sparrowhawk and from “ago” which means false and therefore, false kite referring to its appearance which resembles a kite even if not being really such. The term indicating the species “chimango” is a common Spanish term with which are generically indicated various birds belonging to the order of the falconiforms and of small-medium size (something like our generic term of “falconet”). The nominal subspecies (Milvago chimango chimango) is distributed in northern and central Chile and Argentina, through Paraguay up to Uruguay and the adjacent Brazil. The other subspecies (Milvago chimango temucoensis) is distributed in southern Chile (close to Concepciòn) and in southern Argentina as far as the Tierra del Fuego and Cape Horn. It has been introduced in Easter Island. It is the most common raptor in large part of Chile and Argentina. It frequents all types of open country. This raptor can be found in the grassy locations of the Andes, in the moors, in the steppes, in the meadows with shrubs and in the open woods, in the fields, in the swamps, in the fluvial valleys, along the coast and even in the villages (abundant and common around many cites, it frequents a lot the fishermen villages). This caracara lives also on the temperate slopes of the Andes (in Chile and in the adjacent Argentina); its presence has been reported up to 4000 m of altitude. It has been seen looking for food in burnt soils. Some populations are often strictly tied to the man as they nourish of leftovers and rubbish produced by him. The southern populations appear, at least partly, migratory. It is vagrant in the Falkland Islands. The caracara chimango is 38-41,5 cm long; the male is slightly smaller with a weight of about 289 g against the about 300 g of the female. The livery is wholly brownish with dark striae on the sides of the head and on the back neck. The lower part is mottled or barred of reddish brown; the coverts of the under-wing are of cinnamon colour barred of brown and of “grey-brown deer”; of the same colour are also the remiges, always when seen from below, in these last with bars more markedly present on the secondary and tertiary remiges. The tail is rather long and is mottled of grey-white with a wide sub-terminal black band. When flying, are visible the white coverts of the undertail and the pale grey rectrices with “skin of pale buffalo” bars and black tips. The face is more plumed than the Milvago chimachima. The iris is brown; it has a small portion of pink-reddish bare skin extended between the eye and the beak. The legs are grey-bluish-yellowish. The beak is fairly straight with horn grey-yellowish hooked tip. 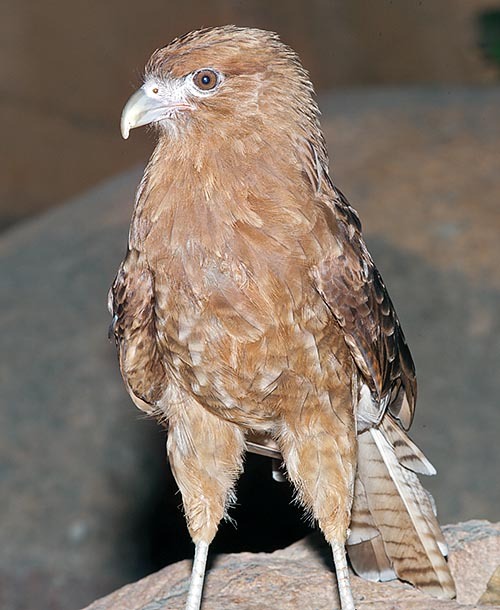 Overall, it is similar to the immature specimens of the other species of caracara (genus Phalcoboenus) but decidedly smaller (being the smallest among the raptors just generally indicated under the term of “caracara”). The immature specimens have strongly reddish hues often with white spots. 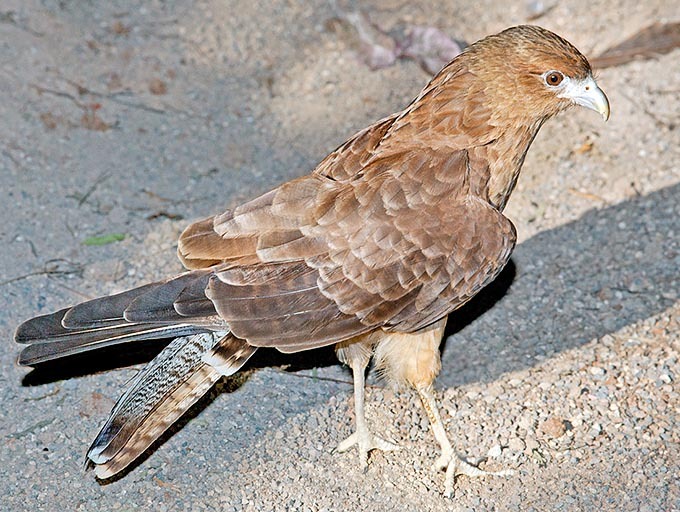 The subspecies temucoensis is darker, “smoky brown” and more heavily marked of dark. It feeds on carrions as well as on live preys. It actively hunts insects, worms, amphibians, lizards, passerines, small mammals. It eats also eggs of various species of birds as well as of turtle which it catches at the time of the deposition. It can be an important predator of nestlings in the nesting colonies of aquatic birds; predating, for instance, the chicks of the brown-hooded gull (Larus maculipennis) and those of the southern lapwing (Vanellus chilensis). It has been observed while copiously nourishing in large swarms of insects and they have seen hundreds of individuals following, at the same time, the ploughings in order to find the insects uncovered by the ploughs. A study carried out in Chile on the diet of this species has evidenced that it nourishes for the 87% of insects (mainly coleopterans and orthopterans), for the 9% of worms (oligochaetes) and for the 4% of unidentifiable rodents, birds and lizards. It hunts the preys chasing them in all ways, even running after them and hopping on the ground, it can reach the point of attacking other raptors for stealing them their prey. The caracara chiming, like the others caracaras, is very versatile, intelligent and opportunist. The intelligence of the caracaras reminds, in some ways, birds considered as the more intelligent (like, for instance, the corvids). It is a species which observes and quickly learns to take advantage of new opportunities for recovering the food. In southern Chile, close to the crustaceans processing factories, large flocks of this raptor unite together with groups of kelp gulls (Larus dominicanus) for eating the working leftovers which remain stuck to the rejected shells. It has also been seen stealing whole clams, during the working process in the factories, and then breaking them autonomously and finally eating the molluscs. At last, this odd raptor has been sighted hunting small animals which were running away from the ablaze lands, eating animals invested on roadsides, catching tadpoles in the puddles, nourishing of ticks attached to the backs of grazing cattle, removing pieces of flesh from the sores caused by the saddles in horses and reaching the point of eating horse dung and vegetal material such as wheat and some fruits. In Argentina, this species reproduces from September to November (austral spring), with a peak in October. In the Tierra del Fuego they have seen, in January, just fledging young and still nourished by the parents. The caracara chimango, during the nesting time, has colonial habits: in an Argentinean site they have counted 56 nests in 0,7 ha where the nests were placed at only 10 metres one from the other. Often, the nests are built on trees but they do not have problems in nesting also on the ground. The nest has an average diameter of about 35 cm and is built with twigs and small sticks, often covered internally with fluff and down. Usually, 2-3 (average of 2.77) eggs are spawned but there are reports of hatchings with even 5 eggs. The eggs are variably dotted and spotted of brown. The incubation lasts 26-27 days and starts with the first spawned egg. The pullets are covered by abundant clear yellow hemp colour. The young take off when 32-35 days old.